Television plays a role in the daily lives of most Americans—but its influence can be even greater among the fan groups that spring up around popular shows. To explore the interplay between one television director’s work and the fan culture it inspires, Notre Dame seniors Stephanie DePrez and Ellie Hall traveled to Southern California on Undergraduate Research Opportunity Program grants from the College of Arts and Letters’ Institute for Scholarship in the Liberal Arts. 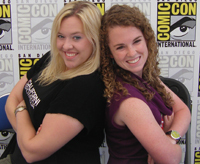 The students—both majors in the Department of Film, Television, and Theatre—interviewed industry professionals in Los Angeles and attended the annual San Diego Comic-Con International, a mecca for fans of many pop-culture genres, from graphic novels and video games to film and television. While DePrez used the opportunity to shoot a documentary, Hall gathered vital research for her senior thesis. Both seniors focused their work on writer/director Joss Whedon, creator of Buffy the Vampire Slayer and Firefly, among others. “Whedon’s position as a television auteur, his commitment to pushing storytelling media forward, and his aptitude for creating diehard fanbases with whom he openly communicates make him one of the most relevant subjects of television study today,” DePrez says. While at Comic-Con, the two attended Whedon-led panel discussions; interviewed fans, showrunners, writers, and executives; and pored over any and all information they could find to aid in the development of their projects. Both students agree that a team approach was key to getting the most out of their time at the busy convention. They shared what they were learning and helped keep each other focused and motivated. Hall and DePrez also discovered what it means to lead a research project from conception to completion—and that it doesn’t always turn out as expected. DePrez focused her documentary on the impact Whedon’s shows have on pop culture and whether his dedicated followers, in turn, can influence the medium. Similarly, Hall examined the symbiotic relationship between Whedon and his fanbase in order to gauge the power of cult icons to enact change in the industry. Research in the field forced both students to revise their initial assumptions. Likewise, DePrez says she started to panic at first because no one was talking about what she wanted to be the focus of her film. But, she says, the challenge turned into an exciting opportunity to present a new argument within the realm of television studies. Throughout this experience, both Hall and DePrez say that Christine Becker, associate professor in the Department of Film, Television, and Theatre, has been a fundamental source of support. “I cannot overemphasize the role that she has played in my academic, intellectual, and personal growth throughout my undergraduate career at Notre Dame,” Hall says. “Fan studies is a hot topic in the world of television right now, and Professor Becker helped me home in on a facet of it that would be worthwhile to pursue,” she says. “As my thesis has changed, she’s been the first to point out how interesting my findings are. Originally published by Joanna Basile at al.nd.edu on May 16, 2011.